Two men have been attacked in a Greenbank house with a bladed weapon. The incident happened at around 5.30pm on Wednesday in the Pitcairn Grove area. A 43-year-old woman within the property heard a disturbance in the hallway area and was met by three men who had entered the address armed with a bladed weapon. The men attacked a 48-year-old man - who was also inside the property - with the weapon, leaving him with serious head and arm injuries. A second man, aged 32, intervened and received a laceration to his hand. Emergency services attended and both men were taken to hospital. The 48-year-old remains in a serious but stable condition with the 32-year-old released following treatment. Police are now appealing for the public’s help. Initial inquiries have established that the suspects arrived at the property in a black Audi A5 bearing the false registration plate YN63 MKD. The vehicle was found on fire a short distance away in Harperrig Way. The suspects are believed to have then left the Oxgangs area in a second vehicle, described as a silver hatchback car, possibly a Ford Focus. 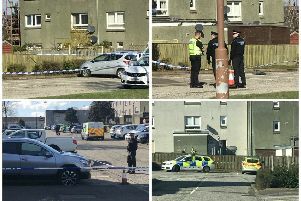 Detective Inspector Bruce Coutts, from Corstorphine CID, said: “The 48-year-old man has suffered serious injuries as a result of this incident and was subjected to a sustained attack with a weapon. “We believe the three men involved were all wearing black clothing and balaclavas covering their faces and used two vehicles during the course of the incident. “I’m especially eager to hear from anyone who may have seen either the Audi A5 in the area of Pitcairn Grove immediately prior to, or after the incident, or who saw the suspects leave the Oxgangs area in the silver car after abandoning the Audi in Harperigg Way. Those with information are asked to contact Corstorphine CID via 101, and quote incient number 3117 of 13 March. Alternatively a report can be given to Crimestoppers anonymously on 0800 555 111.